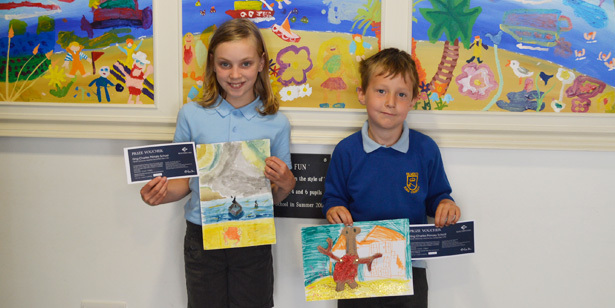 We have announced the winners of our art competition held with King Charles Primary School, which marked their crab celebration at Rick Stein’s Fish, Falmouth. The competition saw pupils from across the school get creative entering their collages, paintings and drawings after we challenged them to enter their best crab themed artwork. Lucas, age 5, and Maddy, age 10 from King Charles Primary School were chosen by Jack Stein out of over one hundred entries from the school, each winning a family meal at the restaurant. The crab celebration saw the restaurant introduce an exciting crab menu including dishes such as Malaccan black pepper crab, Maryland crab cakes and crab linguine as well as hosting sea shanty band, “Swinging the Lead” and running competitions throughout the month. Although our crab celebration is now over, you can still enjoy a menu of local fish and shellfish inspired by Rick’s travels at Rick Stein’s Fish, we are open every day between 12 – 2:30pm and 5 – 9pm.